Aiello grabs a turtle named Slider from its tank. He and Butcher placed turtles on treadmills to study the relationship between muscle contraction and bone strain. The student and professor’s goal is to improve human prosthetics. turtle movement on treadmills could help improve human prosthetics. sciences, and began working on his master’s thesis with Butcher. Aiello and Butcher placed turtles on treadmills to study the relationship between muscle contraction and bone strain. “As far as we know, it’s the only terrestrial study where we can verify these two things exist simultaneously and that adds to the overall stress and strain of your bone,” Butcher said. The study also adds to the body of knowledge about biomechanics and evolution. “From an evolutionary perspective, it’s really important for us to understand how we went from sprawling posture animals,” Butcher said. But Aiello said there could be a very practical outcome of the work, too. “There’s high potential that the data and information we collected and [Butcher’s] previous studies are able to directly contribute to biomedical engineers to develop more realistic prosthetics that model what is actually occurring in nature,” Aiello said. 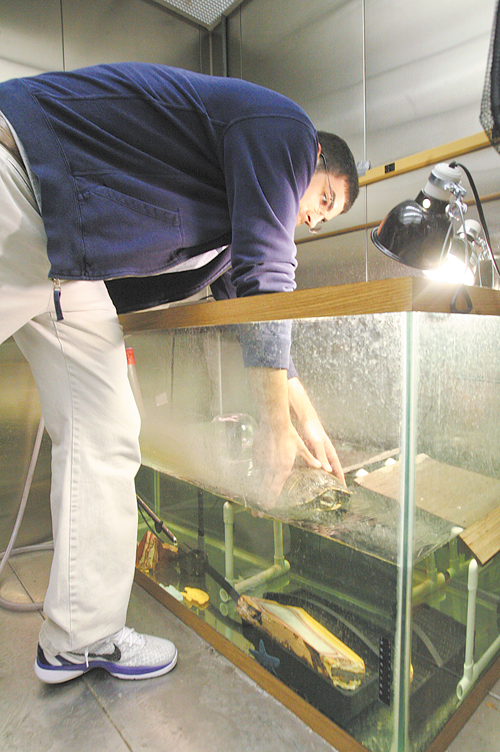 Aiello and Butcher conducted six experiments using river cooter turtles from South Carolina and would train each turtle on the treadmill for about three weeks before an experiment day. The treadmill was a “Jog-a-Dog” brand and small enough to fit in a glass tank. While walking, the turtles would notice their reflection and keep walking toward it. Before the work began in earnest, Aiello and Butcher submitted a internal review protocol that detailed the proposed experiments. That protocol was approved by YSU, the U.S. Department of Agriculture and the Association for Assessment and Accreditation of Laboratory Animal Care International, which is a private, nonprofit organization that promotes the humane treatment of animals in science. “The welfare of the animals is always on our minds, and everything we do is approved by accredited institutions,” Butcher said. When it came time for experiment days, Aiello and Butcher, both trained surgeons, implanted small crystals in the turtles that sent a sonar-impulse between the crystal to determine how much the muscle was changing length. They also used a bone-strain gauge to record the deformation — or the twisting and bending — of the turtle’s limbs while walking and electromyography (EMG) to keep track “when the muscle turned on and the duration it was on,” Aiello said. All of the experiments were recorded on a high-powered camera shooting 125 frames per second. Experimental Biology. It likely will be months before the review and revision process is complete. Aiello will continue his studies in biomechanics in a doctoral program at the University of Chicago. Butcher will remain at YSU, teaching and pursuing new research projects. “We have the inglorious work. ...Fundamentally, we’re making a contribution to our understanding of science. Biomechanics is all about structure and function: How is something put together and how does it work? And that really excites us, that’s what gets us out of bed in the morning,” Butcher said.